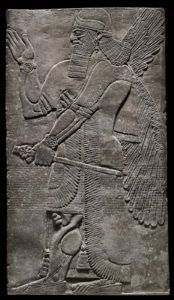 The winged protective deity is a preserved work of art also known as Relief of a winged genius was created during the Neo-Asyrian period, during the reign of Ashurbanipal II (883-859) B.C in New Eastern Mesopotamian, Assyria. 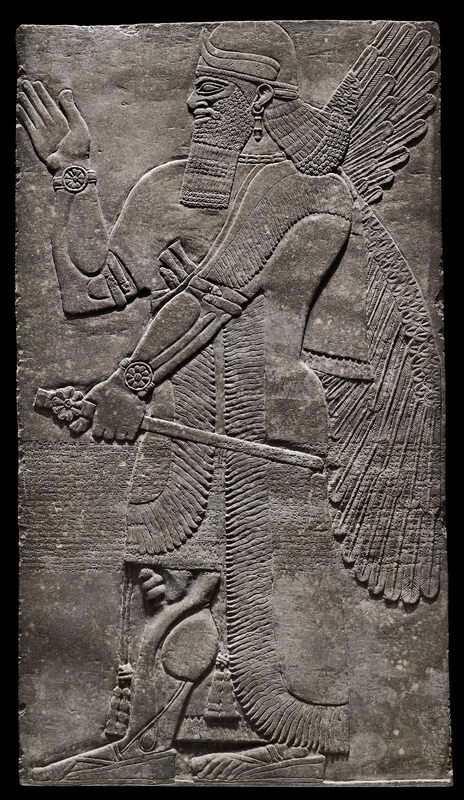 This work of art was done as a slab delineating a winged (or “apkallu,” antediluvian sage) holding a mace from the Northwest Palace of Ashurbanipal II in Nimrud. Over the center, the board is engraved with the “Standard Inscription” of Ashurbanipal II. This piece of work has a dimension with respect to its height x width x depth: 230 x 132 x 9.4 cm. The medium through which it was made was Gypsum taken from the remnant of the Northwest imperial palace located at Nimrud, the Assyrian empire capital which is now based in modern Iraq. This piece is a craft from a royal palace wall, which was inscribed upon. The art contains several particular analyses which have a dramatic depiction through its description. An important significance of this art is the fact that it portrays the king’s military adventures and hunting. The art basically represents the king’s right; the entire works of art around this reign depict the positive or negative ways the king would rule his kingdom. Therefore, this work of art is simply an adoration of sovereignty. The royal palace’s walls which were constructed by Ashurbanipal II were beautified with carved stones in low relief, portraying his military adventures and hunting. This genius was a piece of a grouping of winged animals confronting a styled tree and a scene repeated many times in the castle. He appears to be wearing the knee-length tunic, horned top, and long fringed cape in relation with divinities. Another slab depicted a view of fertilizing a tree where the genius grasps in his raised right hand a conical date-palm spathe, the male part of the flower and in his left hand; he holds a little bucket that could contain a magical liquid or dust. Going through the chiseled relief like a mantra is a cuneiform engraving enumerating the king’s family line and such accomplishments as his ability in fighting and hunting and his walk to the Mediterranean. Based on the beautifully carved stones on the wall, and the reality of the styled tree and a scene repeated many times in the castle, they appear to be performing fruitful rites associated with the date palm, a tree held consecrated by the Assyrians due to the nourishment, wood, shelter, food and drink it gives. The cuneiform content which covers the surface is a piece of a standard engraving that extols the victory and significance of Ashurbanipal. This actually portrays the building of his royal residence. There are other traces that still remain of the bright colors with the board was painted, expanding its visual effect, it is found out that the primary capacity of the alabaster architectural is legitimize the king’s tenet and importance through scale and monumentality. The Winged Protective Deity is one of the arts that actually could represent the king right at that time; the significance of this art is also related to a fact that the king is responsible for the country and therefore, if he’s a safe and wise king, then the country would be strong and stable. But if he’s fatuitous, then that would be a worst disaster. In those ancient times, when the entire nation cares about their king, an art is a good way to demonstrate it. However, the main concept of this art is Sovereignty. The Winged Protective Deity and any other art objects are just artistic works that practically analyze and represent a situation in that age. The art objects of these periods are basically in the olden BC ages and they care about sovereignty, and then became religious in their early A.D. This is a great effect to the art world. As a matter of fact, art is not just an object, but they are more like a strong history books that are not composed by letters. There are the fortunes of everywhere throughout the world, and we can read the mental and understand the revelation of our ancient. An unexpected element I observed in this work of art is the stylized tree that actually being faced by grouping or the winged creature, and the fact that it was a scene that was repeated many times. This element is highly unusual as it depicts some ceremonious scenes and can be based on the relevance of the major function the act portrays. Looking at this object closely had helped to understand how to analyze a work of fact considering the historical attachment associated with it. I’ve been able to, through our class lessons visually express all I can see within this work and through my studies and readings about the art work, my evaluations are explicit enough for anyone who has never heard or seen any works of art.